The big question in 2017 HBCU football season is who will step into the void left by these all-time greats — Lenard Tillery of Southern, now with the Los Angeles Rams, and Tarik Cohen of North Carolina A&T, with the Chicago Bears — now that they’ve moved on to the NFL. On offense, two senior quarterbacks, Grambling State’s DeVante Kincade and Southern’s Austin Howard, are at the head of the class. Kincade was fourth and Howard 14th in Football Championship Subdivision (FCS) passing efficiency last season. Kincade, an Ole Miss transfer, lit up the Southwestern Athletic Conference, passing for more than 3,000 yards and 31 touchdowns with just four interceptions while leading the 11-1 Tigers to Southwestern Athletic Conference (SWAC) and Celebration Bowl championships. He spent time in early July mentoring the nation’s best freshman quarterbacks at the Opening Elite 11 finals in Beaverton, Oregon. Kincade, who participated in the competition after his senior year in high school, was a camp counselor this year along with heralded FBS signal-callers and Heisman Trophy darlings Sam Darnold of Southern Cal, Mason Rudolph of Oklahoma State and Tanner Mangum of BYU. Kincade, the only FCS player invited, more than held his own, finishing behind only Darnold in the skills competition. Florida Gators quarterback Treon Harris (3) drops back to pass in the 2nd quarter of the NCAA football game between the Florida State Seminoles and the Florida Gators at Ben Hill Griffin Stadium at Florida Field in Gainesville, FL. Howard, already Southern’s all-time passing yardage leader, was nearly as efficient as Kincade, throwing for more than 2,500 yards with 29 touchdown passes and just eight picks last season. With Tillery and multitalented wideout/kick returner Willie Quinn gone, Howard will shoulder more of the offensive load for the Jaguars this season. The only quarterback from a historically black college and university (HBCU) to surpass Kincade in passing yardage and total offense was lanky 6-foot-4, 190-pound Bowie State sophomore Amir Hall (3,596 passing yards, 30 touchdowns). Hall is back to lead the BSU offense that put up 41 points and over 519 yards per game. Noteworthy additions to the HBCU quarterback ranks are two other highly touted SEC transfers. 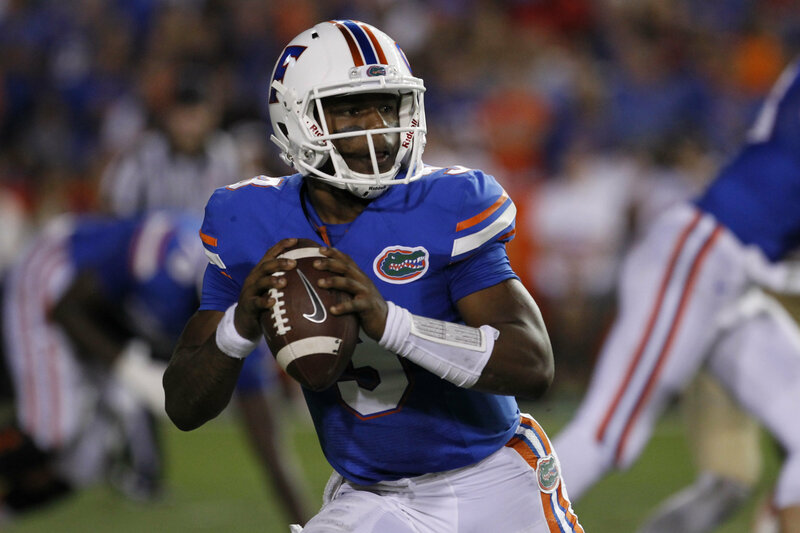 Former two-year Florida starter Treon Harris transferred to Tennessee State after passing for over 2,600 yards and 18 touchdowns for the Gators. Elijah Staley, a highly touted 6-foot-7 gunslinger now at Morgan State, began his career at Mississippi State and hopes to do for the Bears what Kincade did last season for Grambling: lead them to a championship. The heir apparent to Tillery and Cohen as the top HBCU running back is Howard senior Anthony Philyaw. The 6-foot-1, 205-pound Los Angeles native ran for 1,230 yards last season, including an HBCU-best 281 yards vs. Delaware State, 234 vs. Monmouth and 112 against Big Ten member Rutgers. He’ll get plenty of work in former University of Virginia and new Howard head coach Mike London’s offense. Five other 1,000-yard rushers return: Virginia State senior Trenton Cannon (1,214), Lane senior Marcus Holliday (1,126), Fayetteville State junior Stevie Green (1,150), Benedict senior George Myers Jr. (1,092) and Bowie State junior Robert Chesson (1,128). Cannon, the leading returner in all-purpose yards (169.6 yards per game) and scoring (21 touchdowns, 126 points), is perhaps the most dynamic of the group based on his prowess as a kick returner. Another all-around performer returning for his senior season is Grambling scatback Martez Carter. Carter, whose 1,343 all-purpose yards trails only Cannon among returnees, is the primary spark plug for the G-Men. No returning receiver topped 1,000 receiving yards last season, but Tennessee State’s Patrick Smith came close. Smith had 61 receptions for 966 yards in 2016 after hauling in 54 catches for 996 yards in 2015. Smith, the preseason Ohio Valley Conference Offensive Player of the Year, looks to surpass the mark this year. He needs 1,500 receiving yards to become TSU’s all-time leader and could reach those goals with Harris at the controls. 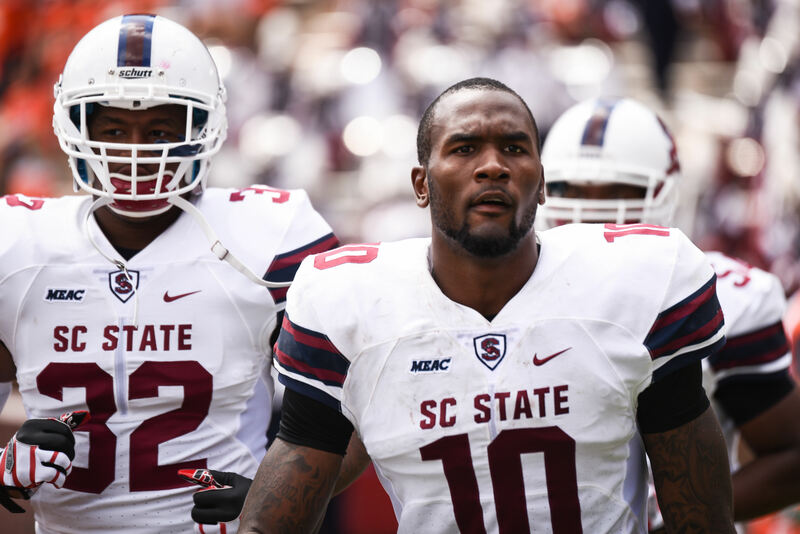 South Carolina State linebacker Darius Leonard’s selection last year as the Mid-Eastern Athletic Conference (MEAC) Defensive Player of the Year was the fourth straight such award for Bulldog defenders. The two other winners — Pittsburgh Steelers defensive tackle Javon Hargrave, a back-to-back winner, and Green Bay Packers linebacker Joe Thomas — are already in the NFL. Expect Leonard to follow suit. His combination of speed and ferocity at 6-3, 235 translated to 124 tackles last season, tops in the MEAC. Leonard is so highly regarded that he’s not only on the Watch List for the Buck Buchanan Award, given to the best FCS defender, but also was recently named one of 51 linebackers on the preseason watch list for the Butkus Award, given to college football’s best linebacker. He is one of just two FCS players on the list. Jackson State defensive end Keontre Anderson (6-4, 235) is nearly of equal size to Leonard but wreaks havoc from the defensive end position. Anderson made only 55 tackles a year ago, but 25.5 of them were for losses, tops in the FCS, including 8.5 sacks. He is the preseason SWAC Defensive Player of the Year. No offensive lineman has been more decorated or dominant than 6-7, 309-pound North Carolina A&T senior Brandon Parker. He is a two-time MEAC Offensive Lineman of the Year and is on everyone’s first-team FCS All-American list this season. Parker, entering his fourth year as a starter at left tackle, has not surrendered a sack in his career and has been flagged only four times in 36 starts. He’s helped the Aggies lead the MEAC in rushing in all three of his seasons. It’s not often that a place-kicker is named among the top HBCU players, but Tennessee State’s Lane Clark fits the bill. Clark, at 5-11, 185 pounds, is said to be one of the strongest TSU players, reportedly squatting nearly 400 pounds. The strength has paid off, as his leg produced four field goals beyond 50 yards last season, with a long of 57 yards.